SpeedGeeking is where a lot of participants show up and move at a signal from one presentation to another. The presenters keep repeating their presentations. In Online SpeedGeeking as Webheads will attempt it we will rotate presentations through our Elluminate presentation room at http://tinyurl.com/y3eh. Elluminate has a countdown timer. We'll set it to countdown 5 minutes. The SpeedGeeker's task is to present cogently and concisely on a topic of choice (non-commercial of course :-) in just 5 minutes. Anyone can present. Scope of topic is up to individual presenters, as long as the topic is covered in 5 min. Anyone interested can sign up at the wiki. It gradually dawned on us, why not try a similar format in SL? We put the event down on our wiki page and invited people to show us their favorite places there, with the caveat that each tour would last 5 or ten minutes. We thought we could get people into SL, exchange friendships, and teleport each other from place to place. And guess what? It worked, and it was F.U.N. On the day of the event, we had only two presenters who had signed up. But it turned out that a lot of webheads appeared at http://tappedin.org/ between noon and 13:00 expecting the event to take place. Doris Molero had come online for another reason and wanted take some pictures of me in Second Life to accompany an interview that she had conducted (and which I blogged here: http://tinyurl.com/090522molero). I said fine but in return she had to show us her favorite places in Second Life. She took us to the Great Wall of Mao (85, 85, 36) and then to a Japanese village with the name Kansai in it (looking for it now, can't seem to relocate it, one of many builds containing the name Kansai). In Kansai Doris found a lovely kimono but the guys in the group could find no clothes, so we went off in search of men's clothing elsewhere, and ended up at Amity Island (116, 95, 23). By then we had attracted a crowd, including Nina who conducted us to Ruta Maya, Mexico 2 (187, 25, 21). This turned out to be a charming place where we could 'rent' horses (for free) by touching them and then 'wearing' them. 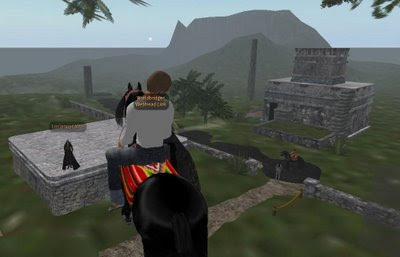 So we rode horses around the build, the beach, and the old ruins there. Fortunately no one got hurt and we all escaped to Webheads Headquarters at EduNation III (72, 36, 21). There the tour ended. But it was interesting, all aboard enjoyed it, and we must do it again sometime.